Former U.S. Cycling Team member Allison Kellagher died days after colliding with a pedestrian in a Boulder, CO crosswalk. Kellagher, who counseled others after overcoming addiction, was riding with her husband Saturday night when another couple activated the crosswalk warning lights and stepped out into the street. Reports indicate that she failed to see the flashing lights and clipped a man, causing her to lose control and crash into the roadway; the pedestrian suffered only minor injuries. Those cracks may look small, but without the helmet, they might have been in my head. Too many people — cyclists and non-riders alike — assume that helmets are the key to bike safety, but a helmet alone can’t keep you safe. Even the most expensive bike helmets are designed to provide full protection against impacts up to 12 mph, and partial protection up to 20 mph. Above that, it’s nothing more than a fancy hat. While the standards refer to the force with which your head hits the ground or some other object, that does have a strong correlation to your speed and the speed of the any vehicle you might collide with. I don’t know about you, but I often find myself riding at well over 20 mph — and don’t know many motorists who drive slower than that. At the same time, mandatory helmet laws may do more harm than good; statistics suggest that Sweden’s helmet law is discouraging children from riding. Don’t get me wrong. I would never suggest that you shouldn’t wear a helmet. In fact, I’ve often credited my helmet with saving my life during the infamous beachfront bee encounter a few years ago. But that’s exactly what helmets are designed for — the kind of relatively slow speed impact that’s most likely to occur when you fall or collide with a slow moving vehicle. It will not protect you at higher speeds, and it will not prevent trauma to any other part of the body. In other words, a helmet may help, but it’s not your best protection as a rider. Staying safe means remaining alert and vigilant at all times, riding defensively and improving your skills in order to avoid collisions in the first place. And never forgetting that even the most skilled and experienced riders can make mistakes. 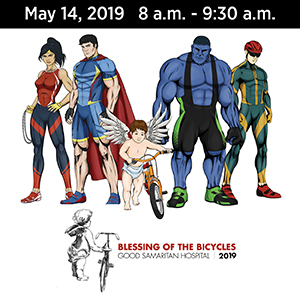 The newly formed League of Bicycling Voters LA will have its first organizational meeting at 10:30 am on Saturday, May 15th, in room 1347 of the UCLA Law School building. 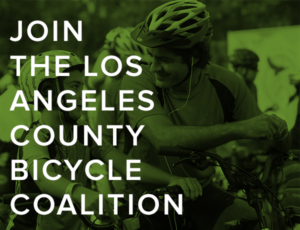 Anyone who bikes and is eligible to vote in the County of Los Angeles is encouraged to attend. SCAG plans improvements to La Cienega Blvd through Baldwin Hills, but evidently doesn’t consider bike and pedestrian infrastructure improvements. 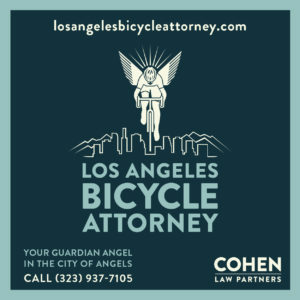 Green LA Girl is giving away free tickets to the Long Beach Bike Film Festival if you comment today. Not every woman rider needs help crossing the street. More on the successful Hollywood e-bike rental program. Sharrows, bike lanes and landscaping, oh my. U.S. Airways destroys a RAAM competitor’s $9000 carbon bike. America’s leading chronicler of biking collisions and how to avoid them has his hand-made custom bike stolen; fingers crossed that you’ll get it back soon, Opus. Just 3.9% of road stimulus spending went towards non-motorized transportation. Lance’s new Team RadioShack and Trek join up to ride for cancer survivors. High school team bike racing takes root in the U.S. Is the bike man’s greatest invention, or does it only seem that way sometimes? A Boulder County Sheriff’s Deputy gets a ticket after hitting a cyclist in the bike lane. U.S. DOT Secretary Ray LaHood says hands-free devices don’t make safer drivers. NYC bike policy is clearly working as ridership rises and injuries drop. Florida cyclists urge the governor to veto a new bill that includes mandatory bike lane use and opens bike paths to motorized vehicles. 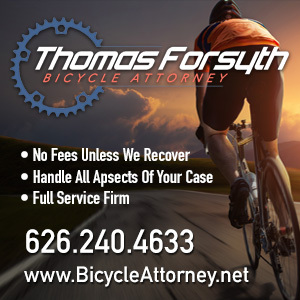 Cyclists should be allowed to pay registration fees if it comes with insurance coverage. Bike events around the world; personally, I’m looking forward to next month’s World Naked Bike Ride. A Brit driver loses his license for a whole year for carelessly killing a cyclist. A pedestrian is injured after stepping in front of a cyclist on a controversial English cycling path. Finally, for those who may have missed it, Yehuda Moon — the bike world’s own online daily comic strip — is back after a brief break, effectively chronicling the cycling community’s newest hero. And this one is a classic. Seriously. There is a disconnect in logic whem it comes to cycling and helmet laws. If bicycle helmets are good for cyclists, why are helmets not also mandatory for motorists, who are more prone to suffer severe head trauma in a collision?